Nanotyrannus lancensis, the “pigmy tyrant” dinosaur is a very interesting taxon that was, until recently, represented by only one specimen. The status of Nanotyrannus has become the center of a continuing controversy that still rages and has spawned a book and even a movie, “The Mystery Dinosaur.” The original Nanotyrannus lancensis, the type specimen (the specimen used to describe a new species), is a nearly complete skull found in 1942 in Montana in the Upper Cretaceous Hell Creek Formation by paleontologist Charles Gilmore. It was studied and named by Bob Baaker and colleagues in 1988.The actual skull shown is housed at the Cleveland Museum of Natural History in Ohio. For years it remained the only example of Nanotyrannus. Meanwhile, paleontologists studying Tyrannosaurus were becoming increasingly anxious to find examples of juvenile tyrannosaurids to complement their studies on adults, and none were being found. Then in 2001, in southern Montana, also in the Hell Creek Formation, a second specimen of what was considered to be Nanotyrannus was discovered by amateur paleontologists from the Burpee Museum in Rockford Illinois. This specimen, named “Jane” turned out to be a fairly complete skeleton, including most of the bones of the skull. Here is a cast of the skull of “Jane,” presently housed at the Burpee Museum. 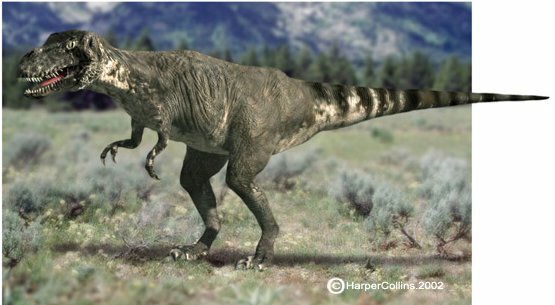 A controversy emerged before long between those who wanted “Jane” to be a juvenileTyrannosaurus rex and those who considered “Jane” to be a second example of Nanotyrannus lancensis. A conference called by the Burpee Museum in 2005 to consider the nature of this new dinosaur ended with no consensus. The Museum chose to label “Jane” as a juvenileTyrannosaurus rex. However, the question still remains unresolved in the minds of some paleontologists. What was needed were additional specimens that could reveal more about this unique taxon. 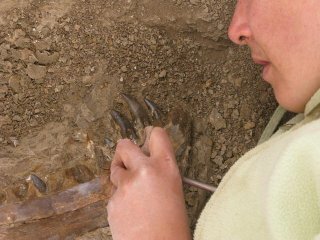 For years, paleontologists have been finding long, thin, blade-like recurved teeth associated with the sediments of the Upper Cretaceous in South Dakota, Wyoming and adjacent areas. 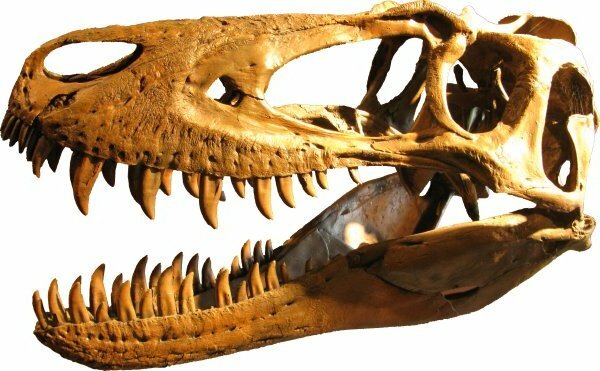 Because of the slender profile of the teeth, paleontologists have been reluctant to ascribe them to Tyrannosaurus rex, because that animal’s teeth are typically more robust and thicker in cross section. These thinner, blade-like teeth have been attributed to Nanotyrannus lancensis by most paleontologists. Shown below are examples of both tooth types. Although the Nano tooth is only 6.5 cm high, it is nearly 10 cm measured along the curvature of the tooth. The Tyrannosaurus tooth is 9.5 cm tall. In 2001, Mr. David Stair sited a new quarry in connection with our excavations in a remote area some distance from the other quarries. A few days later, while doing exploratory work in the area, Zury Franco, a young medical student at the time, discovered portions of the foot of aNanotyrannus on the surface of what has now become Stair Quarry. 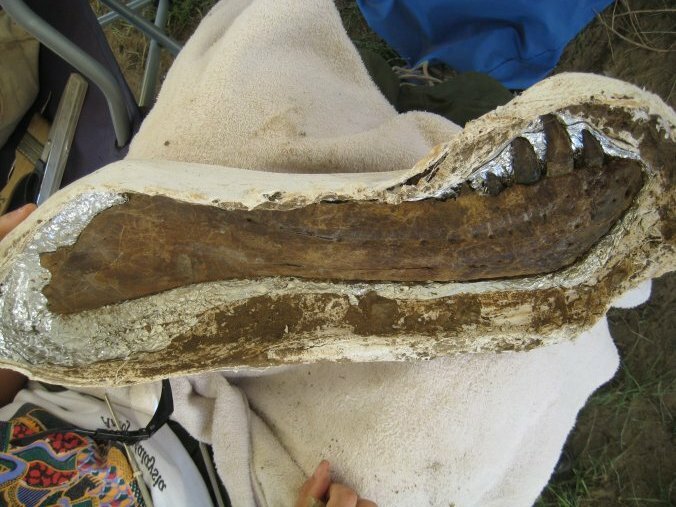 The bones included a claw, several phalanges, and portions of three metatarsals that had been badly trampled by cattle. 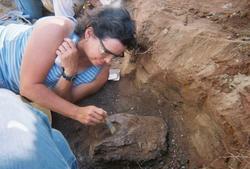 The bones were carefully recovered and the positions were recorded by GPS. However continued excavation in 2002 failed to reveal additional bones and the quarry was abandoned for a time. In 2007, we reestablished the position of the 2001 Nanotyrannus bones using high resolution GPS equipment we have been using since 2000. The position of each bone was flagged and the horizon was extrapolated laterally to existing outcrop. 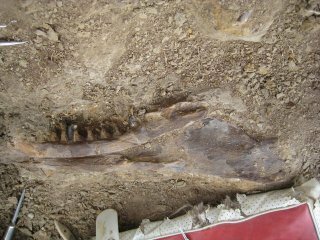 We began excavating in earnest, and before long found several bones that were from Edmontosaurus. 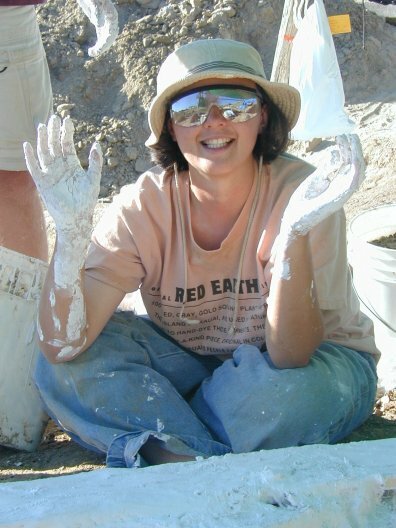 As we continued excavation of the bank, Shannon Workman (below, center) came across the fused nasals of what appeared to be Nanotyrannus lancensis. From that point on the site took on special significance. 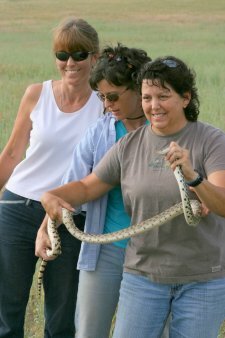 A few days later, Shannon’s sisters, Karen Boich (holding snake), a schoolteacher in Hurst, Texas, and Cathy Vanzant (far left), an ER nurse, unearthed the unmistakablemaxillary bone from Nanotyrannus, confirming the nasal as Nanotyrannus. Subsequent excavations revealed additional Nano bones, and we recognized that this site contained an invaluable collection of bones, and may have originally contained the remains of a complete Nanotyrannus. Probably some parts have since been lost due to modern erosion. In 2008, we made excavation of Stair Quarry a top priority. One of the ranchers, Mr. Dennis Hanson brought in a backhoe and removed the overburden from about 35 square meters. 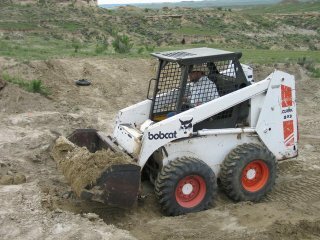 He then carefully cleaned up the excavated material with a neighbor’s Bobcat tractor (picture on right). We invited (now) Dr. Zury Franco to come back to help us with the project. Under Mr. Stair’s watchful eyes, Zury and several of our most skilled excavators were engaged with the search for bones in Stair Quarry. 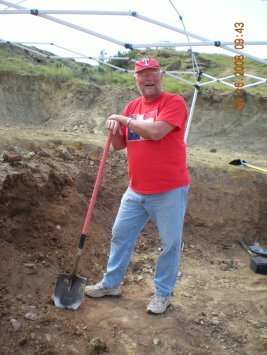 Then on June 12, Stephen Baccus found the lower jaw. That was an exciting discovery! Together Dr. Franco and Stephen carefully excavated the dentary and Dr. Franco completed the preparation. It was beautiful! You can see the excavation progressing in the picture to the right. When the top surface of the jaw was fully exposed, the sediment around the bone was excavated well below the level of the jaw, leaving the bone on a pedistal of mudstone. Next, the dentary was covered with aluminum foil and a plaster cast was formed over the bone and the surrounding pedistal of sediment. When the cast was fully hardened, the pedistal was cut off under the cast and flipped over. Then the underside of the jaw (which in life would have been the outward facing surface since it was buried with the inside facing up) could be exposed by carefully removing the pedistal sediment. Now the underside of the dentary was visible (picture, left). It was a beautiful sight to behold! When the preparation was complete, it was clear that the bone had integrity and could be lifted carefully out of the cast. Final preparation work, done carefully and expertly by Dr. Franco with Stephen’s help, resulted in a beautiful specimen. 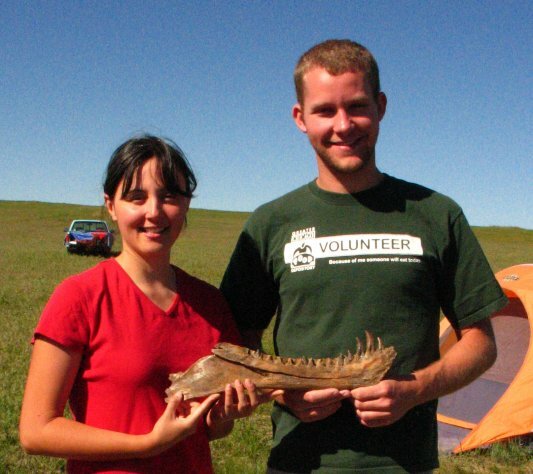 The picture on the right shows Stephen and Dr. Franco holding the completed dentary. To see a 3D image of the completed dentary, click here. As we continued excavation in Stair Quarry, we found several other bones of the skull as well as some ribs and other parts of the skeleton (diagram on left of Stair Quarry bones with Nano bones circled with red). But certainly more discoveries ofNanotyrannus bones await us in the future, and you can well imagine that we are anxious to get back to the quarry to continue excavation next season. Since 2007, another specimen of Nanotyrannus that appears to be complete has been found, and some other material that appears to be authentic juvenileTyrannosaurus has come to light. So, while the picture is still incomplete, it appears the case for Nanotyrannus lancensis as a legitimate taxon is quite strong. Skip the Puzzle! Take me to the Museum!